At the > Powersphere several top speakers will be coming. From IBM Brent Peters, > Ed Brill, > Niklas Heidloff and > Marcel Klotz will be there. Furthermore > Daniel Nashed will hold a presentation. News and interesting topics about IBM Lotus Notes/Domino, LotusLive, Lotus Traveler, Websphere Portal, Project Vulcan and several other topics. Don’t forget the 15th September. The Powersphere will take place in > Paderborn, Germany. You can register here: >registration page. So, please take note of the date and my blog or just > follow me on Twitter. Last week > PAVONE published a new update of his Atom/RSS/Twitter reader for IBM Lotus Notes/Domino. The update contains no new feature, but some detail improvements. Especially if you are working with the Newspaper functionality and the News preview. 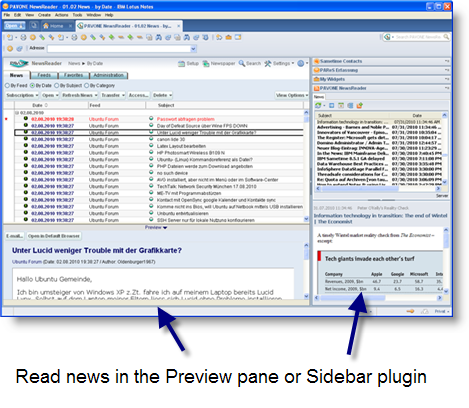 The > PAVONE NewsReader application can be used as a Lotus Notes application or as a Sidebar plugin. The main advantage against other Atom/RSS/Twitter reader are, that you can put it on your IBM Lotus Domino server and all people with access can read the news. It is not necessary that each user collects the news from the sources. If you like to try it, it is free of charge for personal usage. Some days before Christmas a new version of the > PAVONE NewsReader is available. It is an IBM Lotus Notes/Domino-based RSS/Atom reader. The user can read the news within the application or within a sidebar plugin. The new release 9.5 offers a new user interface. Like the previous versions the personal usage is free. You can download it from the > PAVONE website. The last week I read two white papers about Social Computing. The first was from Socialtext, Five Best Practices for Enterprise Success. And the second was from NewsGator, Delivering ROI with Enterprise Social Computing. Both papers were interesting, since I’m interesting to find out what is the additional benefit for a company to use social software (components). Until now, I found no independently research about experience with such software. Mostly the papers speak about Fortune 100 companies. But the most companies are members of the SMB market. The Socialtext white paper indicates that “employees spend up to 25 % of their day looking for information, which can be 25 % of your staff costs” (based on a IDC research). Further it mentioned, that “only 13 % of people can find someone with a particular area of expertise in their own company” (based on an IBM study). Social software should help to reduce the time to find the information or the people. NewsGator say in the future, all computing will be social. They say, that by reducing the email volumne and support costs are one of the reasons to use social software. Further, the travelling cost can be reduced. Besides this most of the people found their current position by networking. But this could only a reason if they find the new job inside of the company.